I tried making my starter 4 years back. But with a lot of things going around, I couldn’t really keep it. 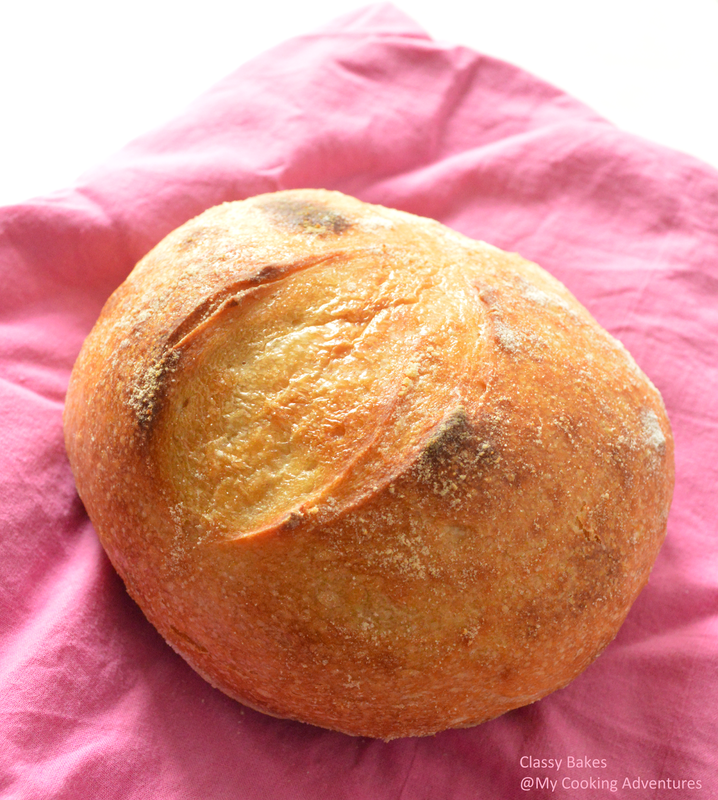 Off late I have been thinking a lot about baking sourdough for my family. And when I got my Carpal tunnel surgery done and was forced to stay at home, i decided to get my starter going. I weighed the ingredients with my left hand, I took help from whoever was willing to help (mostly my maid) to discard and mix.. And there it is!! finally ready!! It has now baked countless batches of crackers (of various flavors) and some good loaves, readily devoured by us!! Look at this mother!! Happy and bubbly.. She is still young but strong enough to bake up a boule!! 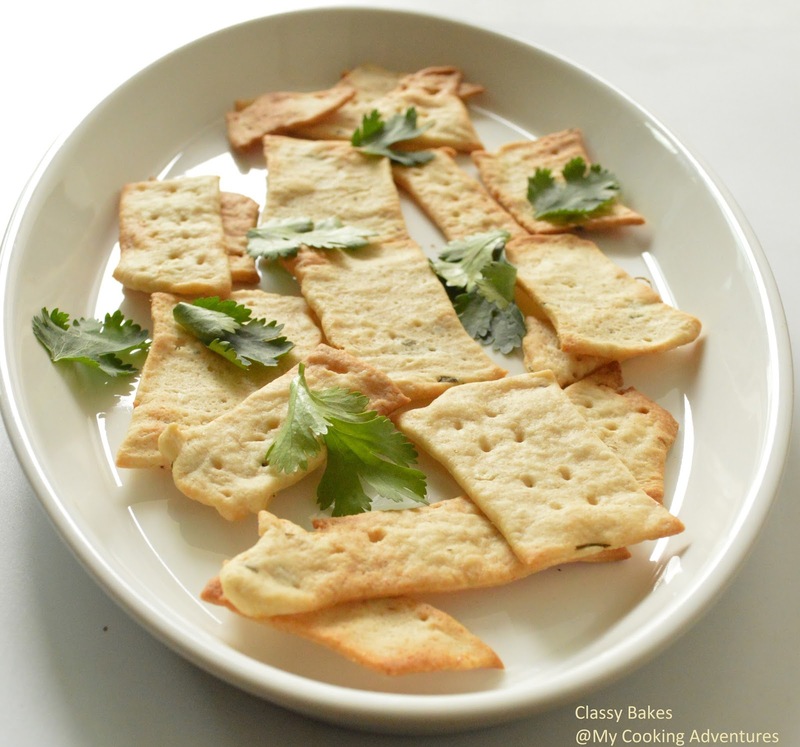 Garlic, Cilantro and herbs sourdough crackers.. Zini’s most favorite thing to dip into her cheesy dip..
You too can make these goodies at home, so start with your starter!! For this recipe or rather formula, I am not going to do a formal recipe post, rather I will just talk about the journey as that is what is most important!! This is a 100% hydration starter. This basically mean that for 100 grams of flour you add 100 grams of water. To make this starter, you need a glass or good quality plastic ( i use glass only, my recommendation glass) big bowl or wide mouthed canister. some spoons and a weighing scale. You will also need flour and water. But most important ingredient is Patience and faith!! Sounds spiritual (and it actually is)!! Once that sorted, let’s start with the recipe, shall we? On Day 1 in a CLEAN jar, take 50 gms of whole wheat flour and 50 gms of All purpose flour. I used organic flour. It helps.. Mix well. Add 100 gms of water to it.. If using jar or canister, cover loosely. don’t make it air tight. On Day 2, you may or may not see some activity in the starter. But chances are that you will see activity if you are in a warmer climate like India. But this are not the critters that we wanted. So discard half of your starter and feed it again with mixture of 50 gms of whole wheat flour and 50 gms of All purpose flour and 100 gms water. On Day 3, your starter may slow down. Still worry not. Keep Calm and Discard half of your starter and feed it again with mixture of 50 gms of whole wheat flour and 50 gms of All purpose flour and 100 gms water. On Day 4, your starter may still not show any sign of life. Patience, my friend! Stay Patient and Discard half of your starter and feed it again with mixture of 50 gms of whole wheat flour and 50 gms of All purpose flour and 100 gms water. Do the same thing on Day 5 as well. On Day 6, my starter smelt like dirty socks.. Panic not. Keep faith.. It’s okay! Discard half of your starter and feed it again with mixture of 50 gms of whole wheat flour and 50 gms of All purpose flour and 100 gms water. At this stage I branched out to a non-organic starter and kept two starters in two separate glass bowls. One organic another non organic. On Day 7, I took 2 TBSP of my starter in a glass bowl, added 30 gms of organic whole wheat flour and 30 gms of organic all purpose flour (maida) and 60 gms of water and mixed well. Similarly in a separate bowl i took 2 TBSP of my starter and added flours and water in the same quantity but the flours were non organic. This was incidentally the day I got the surgery done. On Day 8, I came back from the hospital and with the help of my maid, discarded and fed the starters again. On this day, I fed my starters twice as I was late with feeding. So they were fed once at 12.30 pm and once at 8 pm with 30 gms of whole wheat flour and 30 gms of all purpose flour (maida) and 60 gms of water. On Day 9, I went back to feeding them once a day with 30 gms of whole wheat flour and 30 gms of all purpose flour (maida) and 60 gms of water and continued this routine till day 12. On this day I baked Sourdough crackers from the discard. But continued with my feeding schedule till day 14. On this day, my starter smelt pleasant. Finally baked a boule on Day 14. My Starter was ready finally!! So what happened? how did we manage to catch the yeast? The answer is that it was always there!! since the beginning, it came from the organic whole wheat flour. But it was not dominant till the starter became acidic enough for it to thrive and for other unwanted critter to exit! And thrive it does, just a matter of little patience and faith..
Will be sharing the recipes for crackers and boules in the coming posts.. But before I end, will share some notes..
1) Always use clean equipments. Keep your hands clean too. 2) Be regular with your feedings. Don’t miss them. 3) Always mix vigorously before discarding. Then feed the starter and once again mix vigorously. The yeast likes oxygen! 4) If you see liquid on top, then your starter is hungry. Discard most of the starter, keep a little and feed it. 5) Most important!! Keep faith! I should also warn you that you will be wasting a lot of flour in the process. But you can always use discard for bird feed or cat feed or for making maure if you keep garden. So if you decided to do it, all the best!! In my quest for sourdough starter, a lot of people helped me.. I am so thankful to all of them. The folks at Indian Artisan Bread Baker and Chef Nagpal have been very helpful throughout and holding my hands through the process!! And a special mention for Teresa L Greenway whose online sourdough course on Udemy is as good as it gets. Till the time I took up her class, I was skeptical about online classes, but the way she explains and answers all the questions as soon as you get them is commendable!! Amazing course!! Thanks again..
And of course a big thanks to my family and my maid for keeping and feeding the starter despite their urge to throw away the old smelly goop 😉 and keeping up with my seemingly crazy obsession.. Sorry Sis to hear about your surgery. Hope all is doing good already for you. I'm battling my menopause syndrome which has returned after a lapse of 10 years. so far coping. Sourdough looks absolutely yum. Love the dipping style too. Doing much better now. Thanks. Hope you are feeling better too. I know.. that trash part was something that hurt.. but once your starter is a bit stable, you can make crackers too. that is what i am doing to use up all the discard. Nice and useful post,everything so well explained…Thanks for sharing! The bread looks fantastic! 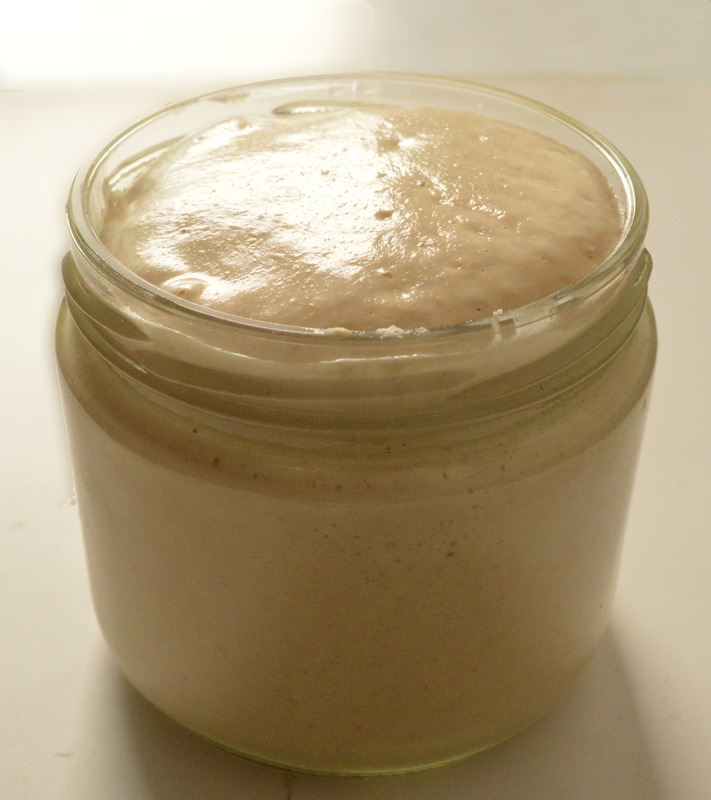 I love my 12-year-old sourdough starter. I usually feed them just rye or einkorn.